Our summary also provides a reminder of other key developments which are to take place from April 2016. You can also find our full sector analysis here. What did the Autumn Statement really mean for you? The current 0% starting rate does not apply to many people as income, such as a salary, exceeds the total of the personal allowance (£10,600) and the starting rate limit of £5,000. The Personal Savings Allowance will however be of benefit to all basic and higher rate taxpayers. In 2015/16 the overall ISA savings limit is £15,240 and this level will be maintained for 2016/17. As announced at Summer Budget 2015, the income rise disregard in tax credits will reduce from £5,000 to £2,500. This is the amount by which a claimant’s income can increase in-year compared to their previous year’s income before their award is adjusted. From September 2017 the free childcare entitlement will be doubled from 15 hours to 30 hours a week for working parents of 3 and 4 year olds. The government will implement this extension of free hours early in some local areas from September 2016. This free childcare is worth around £5,000 a year per child. The 30 hours free childcare offer for working parents of 3 and 4 year olds has been extended to help families maintain childcare arrangements and support the transition back to work at the end of their parental leave or period of ill health. The government has provided that a special 45% rate of corporation tax is to be applied to restitution interest. This measure was legislated for in Finance (No.2) Act 2015. Restitution interest can arise when a company has made a claim to the courts in relation to tax paid under a ‘mistake of law’ where HMRC are the defendants. Any interest award that represents compensation for the time value of money is restitution interest. If received on or after 21 October 2015, this interest will be charged at a special rate of 45%. This rate does not apply to any amounts which represent the repayment of overpaid tax or interest payments by HMRC under statutory provisions. Under current legislation, loans made by close companies to trustees of charitable trusts which are participators, or associates of participators, in the company could be liable to a tax charge of 25% under ‘loans to a participator’ rules. Any such loans made on or after 25 November 2015 will now be exempt from this charge. The new rule only applies where the loan received by the trustee is applied wholly to the purposes of the charitable trust. The averaging period for self-employed farmers will be extended from two years to five years as of April 2016, with farmers having the option of either averaging period. With effect from 30 November 2015, the provision of reserve energy generating capacity and the generation of renewable energy benefiting from other government support by community energy organisations will no longer be qualifying activities for the Enterprise Investment Scheme (EIS), Venture Capital Trusts (VCT), the Seed Enterprise Investment Scheme and enlarged Social Investment Tax Relief (SITR). The government will exclude all remaining energy generation activities from the schemes from 6 April 2016 as well as from the enlarged SITR. The government will also continue to explore options to introduce increased flexibility for replacement capital within the schemes. The government will legislate to update the tax rules for company debt to ensure that they interact correctly with new accounting standards in three specific circumstances. Details of the circumstances will be contained in the draft Finance Bill 2016 clauses to be issued in early December. The intangible fixed asset rules for partnerships with corporate members, which apply to transactions involving transfers of intangible fixed assets to the partnership that take place on or after 25 November 2015. With regard to transactions that occurred before 25 November 2015, the measure will have effect in relation to the accounting debits and credits accruing on or after that date. The government has responded to the final report of the Office of Tax Simplification (OTS) review of employment status and is taking forward the majority of recommendations. The government will legislate to restrict tax relief for travel and subsistence expenses for workers engaged through an employment intermediary, such as an umbrella company or a personal service company. Following consultation, relief will be restricted for individuals working through personal service companies where the intermediaries legislation applies. This change will take effect from 6 April 2016. This will align the treatment for existing micro-employers with all other employers. An additional nil rate band has been introduced where a residence is passed on death to direct descendants such as a child or a grandchild. In addition, the property can pass to a current or surviving spouse or civil partner of a direct descendant.The band is not available for deaths before 6 April 2017. The band will initially be £100,000 in 2017/18, rising in stages to £175,000 by 2020/21. A deed of variation allows a beneficiary under a will or an intestacy to re-direct part or all of the estate they have received to another person. Subject to meeting certain conditions, the parties to a deed can choose that the terms of the deed will be treated for IHT and/or CGT purposes as if they been part of the deceased’s will. Deeds can therefore be very effective at changing tax liabilities. The government will legislate to simplify the tax treatment of income from sporting testimonials. From 6 April 2017, all income from sporting testimonials and benefit matches for employed sportspersons will be liable to income tax. However, an exemption of up to £50,000 will be available for employed sportspersons with income from sporting testimonials that are not contractual or customary. This legislation will apply where the sporting testimonial is granted or awarded on or after 25 November 2015, and only to events that take place after 5 April 2017. The government has set up a new fund that will make available £15 million a year, equivalent to the annual VAT raised on sanitary products, to support women’s charities. This will continue over the course of this Parliament, or until EU rules are amended to enable the UK to apply a zero rate. This is an example of social media in action. A petition, signed by 300,000 people, argued that no VAT should be charged on sanitary products. VAT is already charged at the lowest 5% rate allowable under European law. The suggestion to use the funds for charitable purposes was made to the Chancellor by an MP and is similar to the way the government use LIBOR fines. 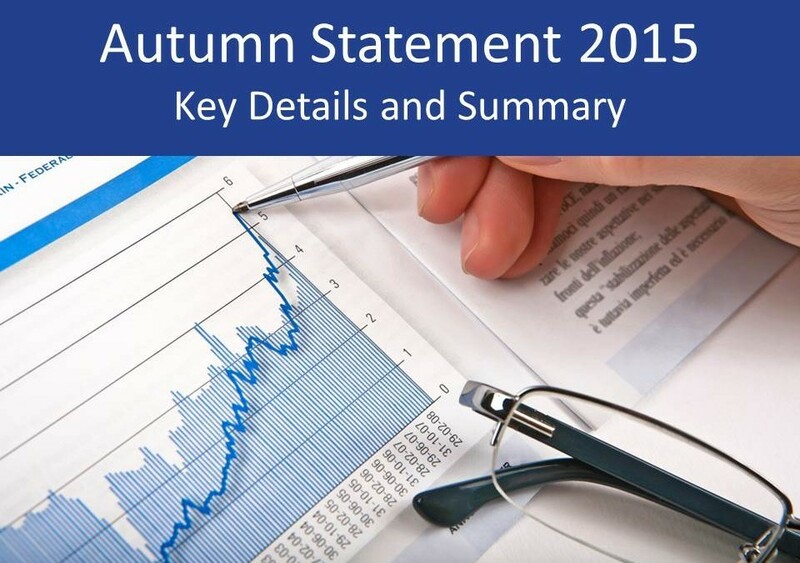 Over the coming days we will also be providing a range of Autumn Statement sector analysis. To keep up-to-date with what the Autumn Statement may mean for you and your business, specific to your sector, please register for our specialists news here.